A homeless man "saved" the lives of a family after he woke them while the side of their house was in flames. Chris Tollerson, who was staying in the family's caravan outside, woke at 03:15 GMT on Sunday to find the property, on Briarbank Avenue, Nottingham, alight. The 21-year-old was visiting his brother Josh Meek, 20, who lives at the house with his partner's family. Mr Meek said Mr Tollerson was a "hero" as he saved six peoples lives including a seven-year-old boy. Alan Good, 44, wife Karen Good, 45, and Oliver Good, seven, were asleep in the house. Mr Meek, his partner Shannon Good, 19, and his younger brother Logan, 16, who had also come to stay for the weekend, were sleeping in another room. Mr Tollerson said he woke up and heard what he thought were fireworks, but then saw the side of the house on fire. The former army cadet said he knew he "needed to get everybody out of the house as quickly as possible". "I was banging on the door, ringing the doorbell, shouting - then Alan opened the door." Mr Meek said: "It's amazing what he has done. He saved all our lives. "The fire service said if it had been 15 minutes later the whole house would have been destroyed. It could have been a very different story. "He's definitely a hero and we'll be forever in his debt." Mr Tollerson, who has been homeless since September, said: "I did what anybody would do. I'm not a hero. "My brother let me stay, so I'm grateful for what he has done for me." He added that he has been sleeping on people's sofas and on the street. 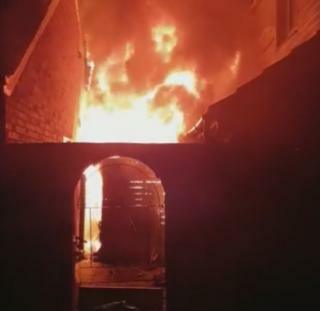 Image caption Mr Meek said most of the family's belongings had been burnt, but "we are alive"
Nottinghamshire Fire and Rescue Service believe the fire was caused by an electrical fault.